I often talk about my dinner club, including my prior article, as we meet at different restaurants the year round. One of the restaurants that we have been going to for years is the Brass Pointe in Farmington Hills, Michigan. This restaurant is more of what I would call a family restaurant with a bar, but the critical point for our club is that they have a private room that will hold forty members. We always have a good meeting there and the food is classic American fare, the greatest asset as far as I am concerned about the Brass Point is the service. There is one waitress that has been handling our group since we have been going there, and she is wonderful; by the time I get my coat and hat off and start arranging my part of the evening’s business, she has a Whiskey Sour at my side, without my even having to tell her what I would like. I would venture to say that she has about sixty percent of the membership’s favorite drink in her memory bank. As is our custom there is usually three different choices for our entrée, but at the Brass Pointe they are very accommodating to our hosts and offer us six choices. We had our choice of barbequed chicken, roasted chicken, spare ribs, cod (either broiled or fried) and barbequed salmon. Of course some of the men ordered barbequed salomon, as this is how it was typed up on our special menus courtesy of our waitress’ son, which got a chuckle or two. I opted for another dish that several people have ordered over the years and that was there “burger” which covers two pieces of their “Texas” garlic toast with cheddar and grilled onions and it was quite the meal. Even though as I stated that I was drinking Whiskey Sours that evening, I noticed on the blackboard as I entered the restaurant that they were touting a new Shiraz wine, and normally I do not have wine at this establishment, but I thought I would try a glass during dinner. I figured that even a mediocre wine with a burger would work, and I was surprised at how even and mellow this wine was, even though I knew in my heart that it would not be a top shelf wine. 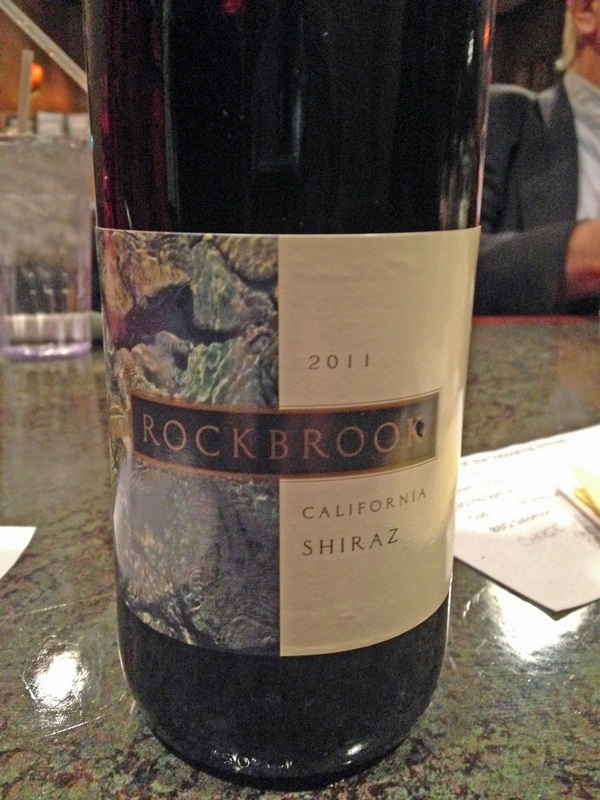 The wine that they were touting as new for them was Rockbrook Shiraz 2011, a California wine. This wine is basically a Shiraz with a “proprietary red blend” and it was very drinkable. Rockbrook is one of the wines from the Bronco Wine Company that has many wines and affiliates and is one of the largest wine companies in California. It is owned by the Franzia family with a 120 year winemaking tradition, and they are not related to Franzia Boxed Wines. I will have another of these wines or maybe try something different the next time the club meets here again. This entry was posted in Dining, Wine and tagged Bronco Wine Company, California, Rockbrook, Shiraz. Bookmark the permalink.